I was visiting my friend D.R. Tunnel and his family for New Year´s Eve 2013-14. They live in Ljubljana, a beautifully city with lots of parks, perfectly settled in the middle of Slovenia with equal access to both, the sea and the mountains. D.R. Tunnel was really keen to take me to this exhibition that he thought would be very interesting to me. It was a retrospective exhibition of Jože Ciuha’s works under the title Labyrinth of Time in Gallery Jakopič. 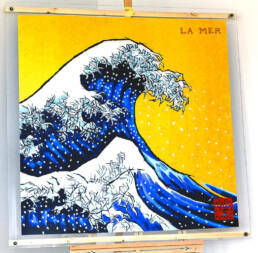 A Slovenian painter who, during the 70´s, painted on plexiglass (PMMA aka Crylux, Acrylite, Lucite, Perspex..) with acrylic paint. I was not aware of this technique at the time, nor was I aware of this painter´s works. But D.R. Tunnel knew that I loved large works with fresh color, saturated, if possible to 200%. So imagine me, being confronted with these 40- year- old paintings that look like they were painted this morning. My mind was blown away. Also, the topic of the paintings, especially those that comment religious practice and iconography, emphasized by the gold backgrounds (and monkeys), just left me speechless. 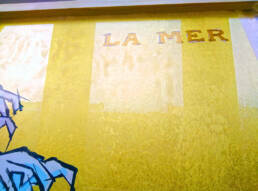 It is one of those exhibitions that you would like to go back to the following day and the day after. D.R. Tunnel was, at the time, planning to adapt this old stone based barn into a summer house in one remote village near the Adriatic Sea. 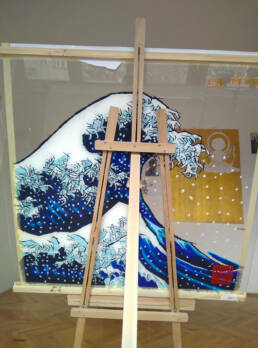 Under the influence of what I have just seen, and as a token of gratitude which I promised to him- I decided that I would paint him the Great Wave on plexiglass for the new house. Since then five years have passed and the planets aligned in a position that made the conditions for this promise to be kept possible, and I was ready. As I had on my mind the cover for La Mer (The Sea) by Claude Debussy from 2015 street art workshop in of Torino di Sangro, Italy, when I was planning to paint homage but instead ended up doing Lupin the III -Leggenda della Grande Onda– this time I had also square based surface, and I decided to do it as such. 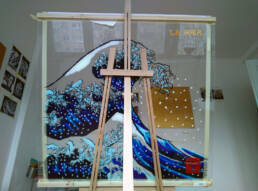 Now those who don´t know, Debussy also adored ukiyo-e prints and he kept Hokusai´s Wave in his working room. 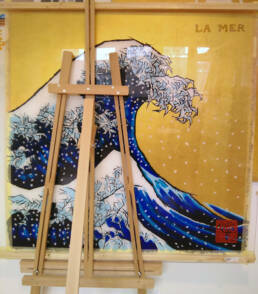 So under his direction the cover for La Mer incorporated the segment of the Great Wave. To me, the cover itself was crudely adapted, and the only thing that I liked about it was this little secluded part of the sea in the lower right corner that I could interpret as an attempt of atmospheric perspective within the two-dimensional colored drawing. 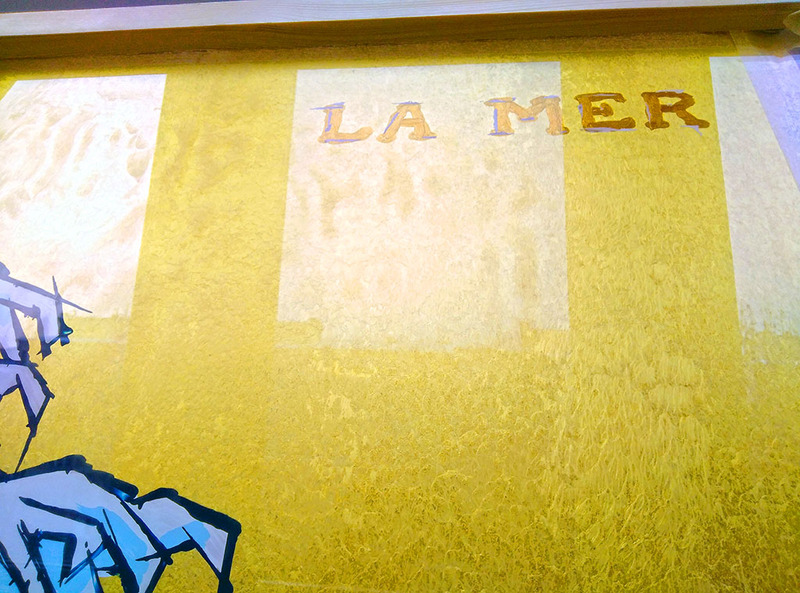 So in my case I approached to this project as if La Mer´s cover was just a rough sketch given to Ciuha to build upon. 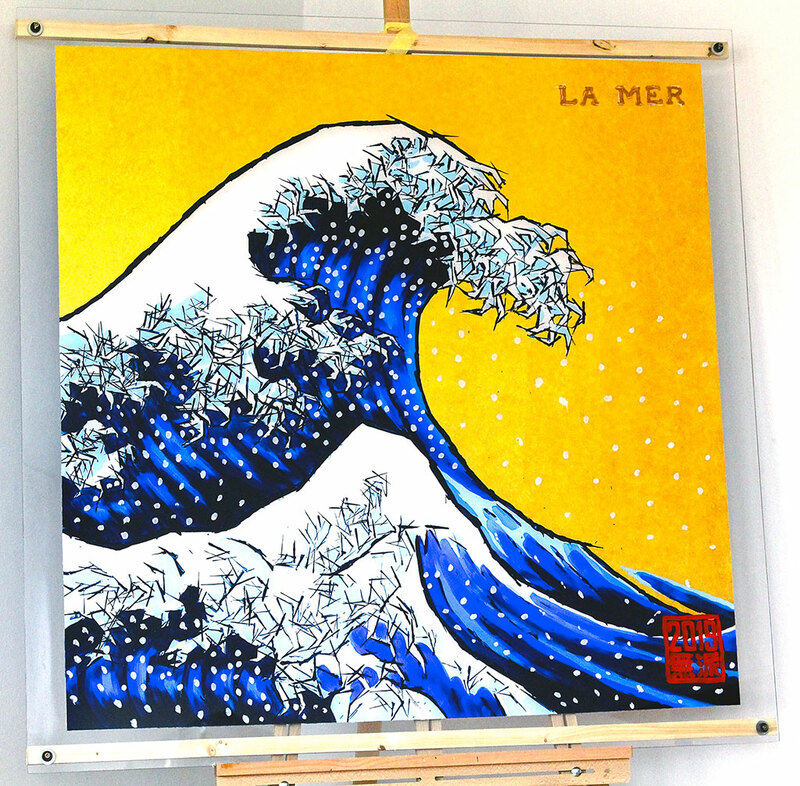 For this Wave as a base I used the first Great Wave I did for the 100 Views of Ukiyo-e, breaking up from Hokusai´s “dragon claw” crest, using my more geometric broken lines crest to emphasize even more the crash and the breaking up of the waves in La Mer. 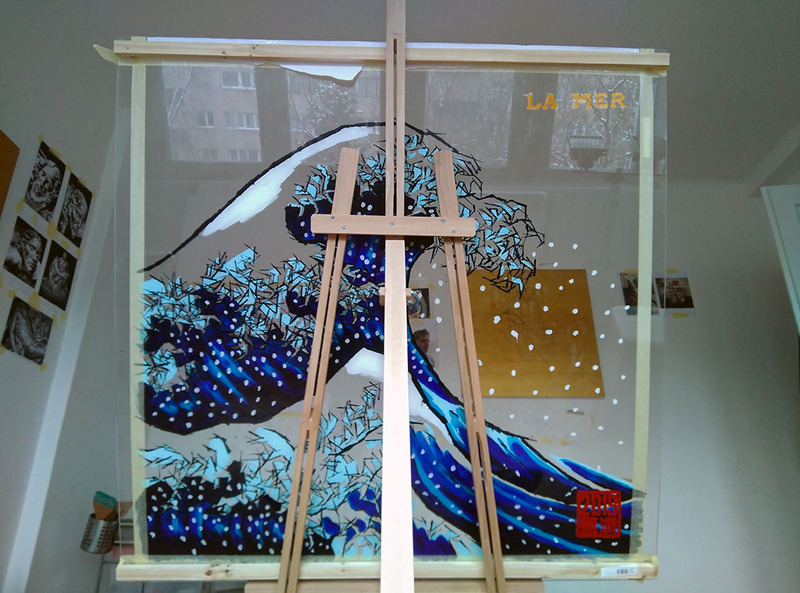 This is the first time for me to paint on transparent surface, and, as those who practice painting on glass know, building up this painting was done in reverse. Also, I don´t know anyone who could show me an example of this technique. So it was quite my own mind work, because it is (il)logical concept crashing with classical painting build up. So I did everything in reverse, even applying soft bandages as final coat to protect it from scratching. Crazy. 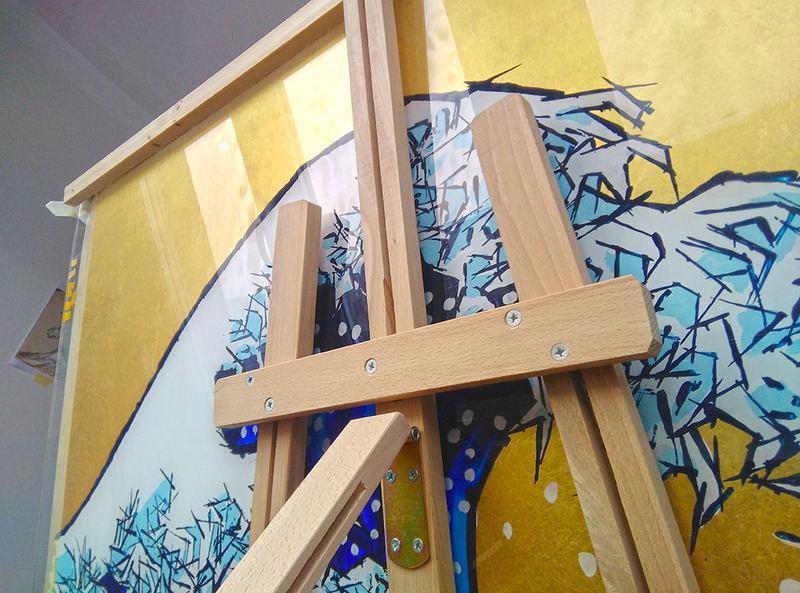 But the result was really good, and I must admit that after doing one plexiglass- based painting I feel very confident in doing another one. So I hope I will spice up the next one with different problem in building it up. For the record D.R. Tunnel was happy, and painting will advance from the summer house to the living room in their apartment in Ljubljana. 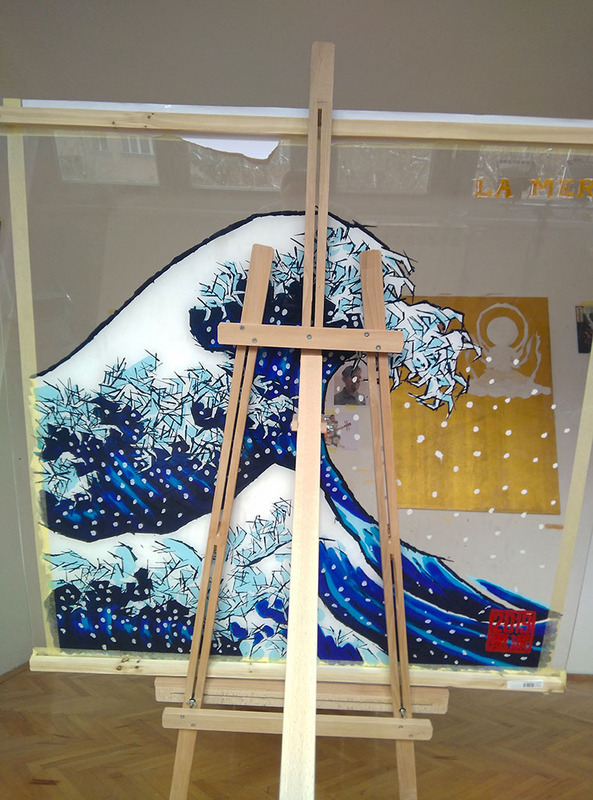 As Great Wave is almost like religion to me, I hope that it has also honored Ciuha´s work.